Hamas terrorists in Gaza promised that there would be more kidnappings of IDF soldiers, since the kidnapping of Gilad Shalit was a success. Hamas terrorists in Gaza promised that there would be more kidnappings of IDF soldiers, given the success they realized by nabbing Gilad Shalit five years ago. Hamas held a huge rally in Gaza Tuesday night, with tens of thousands calling for the destruction of Israel and for freedom for all terrorists still in Israeli prisons. Terrorists were released not only to Gaza, but also to Judea and Samaria and even Israel proper,[ although 40 of the first group must leave the country, ed.] This deal drew the map of Palestine, and our future, in that all borders of Palestine were included in the deal,” Haniyeh said. 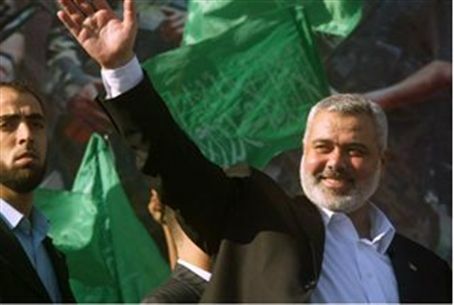 Hamas' Damascus head Khaled Masha'al, speaking in Cairo earlier, said that the deal was “a great accomplishment that brings great light to our history, and requires us to do the same in the future. The military groups that defeated Israel will continue in their work. All the Israeli technology was unable to defeat our unadorned hands in this battle,” he said. Over 250,000 people gathered in Gaza City's central square Tuesday night, holding Hamas flags and pictures of terrorists still remaining in Israeli prisons. “The people want a new Gilad,” the crowds cheered. Several of the 296 terrorists are set to speak at the rally Tuesday night.